Why is the escalator at Pike and Broadway always broken? As far as annoyances go, it’s puny. But a recent observation posted to Twitter captured the issue in a most excellent way. It’s funny because it’s true. 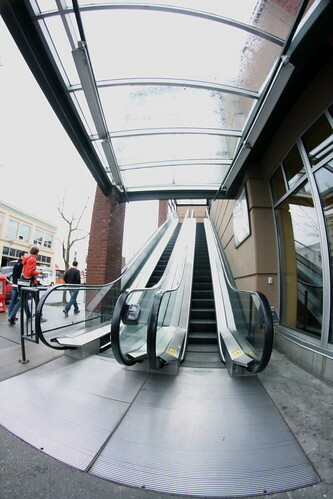 The escalator at Pike and Broadway’s Harvard Market shopping center is always broken. The result is an ongoing cycle of small but expensive repairs — a recent decision by somebody to kick in the escalator’s emergency button cost $11,000 to fix. The Harvard Market is a peculiar development on Capitol Hill. We looked at the 90s-era shopping center’s history in this 2010 CHS article. With a large upper level parking lot as well as an underground garage, it has parking assets unlike any likely to be seen on Capitol Hill again. The retail units are 100% leased these days, Groberman says, with a new salon the latest to join the mix. Groberman says its a successful shopping development. Now they just need a solution to keep the escalator running — or at least useful as stairs. “If people in the area abuse it, what can we do?” Groberman says. We’re assuming the CHS comments might have a few ideas. …there’s something that can be done about the wicked urine smell in the west-facing stairs. It’s rank. Are we that lazy? Keep the elevator sure, needed for ADA compliance and all. The Washington DC Metro escalators often end outside: probably a design decision to announce the presence of the subway, but I gather that they also suffer from ongoing maintenance issues. Gather that is blamed on weather! In older subway systems the escalators started inside the ticket halls (remember tickets/tokens?). Maybe that’s the long-tem solution. (though constant rain rinses might help with the urine smell). Sounds like a lot has been spent to try and keep the escalator and elevators working in this place. I wonder if it would be cheaper for property owners to get surveillance equipment and hire a guard to keep an eye on things. Post signs around property letting everyone know they are being watched and if they break the owners property they will be required to replace it. If they can’t afford to do that then they can do public service until the amount is worked off based on state minimum wage. People do this because they get away with it. I have seen drunk people do stupid things and then half of the group laughs and sometimes half the group leaves a little disgusted that they chose to spend their evening with the likes of the other sort. Rarely though do I see people held accountable for their stupid actions. Stupidity hurts, only it’s not the dumb ones in pain. The escalators into Westlake Station are often in disrepair, as well. Or at least, they seem to be every time I go in with a rolling suitcase. The escalators in/out of the DC Metro (some of which are very, very long) are functional about 30% of the time, as far as I can tell. I’m guessing vandalism and exposure to the elements are not good for escalators, generally. Seems like some bright engineers could do something about that. It’s weird. For being such a high traffic area, full of higher end stores, and being the entry into the QFC, that corner is the sketchiest spot on broadway. Drunken club goers, intimidating thugs, aggressive panhandlers, and the mentioned rank urine smell. Maybe the solution is a guard. The thugs and their fellow travelers will object. So be it. That would be my idea too. Why stairs, elevator, AND escalator? Most of the time they’re functioning as stairs anyway. Aye, same at the convention center station, its like escalator whack-a-mole, as soon as one gets fixed, another goes out of service. At the convention center, the physical stairs as too narrow to really allow for a full duplex flow of people going up and down the stairs. This was my thought as well: could repeated $10K repairs instead be mitigated by a security presence? Just a thought. I always take the stairs for health reasons, but they are typically blocked with packs of homeless kids or QFC employees on their smoke breaks. QFC has security inside the store and still you would not believe the crap that goes on there EVERY day. The management company used to have security patrolling outside and on the upper and lower parking lots, but they’ve been gone for months. Hiring a guard doesn’t seem feasible, unless the guard would just be on night watch. They’ve spent $250k over the 17 years the complex has been open, or about $14,700 per year. I don’t know what a full-time security guard gets paid, but I’d have to think it’s more than that. I think it’d kill two birds with one stone if they just tore out the escalators and put in stairs. They would no longer have the expense of repairing the escalators, and it would lead to increased traffic in the elevators, reducing the likelihood of vandalism there. I’m sure the lack of security personnel is based purely on economics. According to the state salary survey for last year, security guards make $43K a year in King County (I think that’s high, but that’s what the state says). Even with few to no benefits, taxes and fees boosts the cost to $48K per year for the management company. If they have security 24-7, they would need to hire four guards (three 8-hour shifts, plus one to cover days off). That translates to $192K per year to have a single guard on duty 24 hours. Morris Groberman didn’t mention the time period that they spent the $250K for elevator/escalator repairs, but if that was over the 15-year existence of the Harvard Market (opened in 1996-7), that equates to an annual outlay of only $17K per year for repairs. Even if you attribute ALL of that to vandalism which could be stopped by security, it’s hardly worth the expense of hiring guards. SHOULD they have security? Yes, of course. But until something really serious happens there, I doubt they will. replace the escalator with stairs for crying out loud. what has the people of capitol hill gone to? I would be happy if the escalator was replaced with stairs. Or if there was some way to move the elevator to where the escalator is and have it be completely transparent so that people can see what is going on inside, that would cost a lot of money though and still not completely effective against cracked out homeless youth who probably see the elevator as some sort of government thing they need to destroy rawr anarchy. Get a DVR and put a couple video cameras up, both visible and hidden, and catch the bastards in the act. Once you prosecute one or two people for $10000, the problem goes away. There are stairs toward the right of the door… using them always seems sketch. I would think twice about using them after dark. Removing the wall so they would be visible from the street would fix the problem. There’s also stairs down to the parking garage there… not well lit and totally sketch. 1) There isn’t a wall. The staircase just feels blocked in. 2) There’s a security guard watching the stairs! Another view with the dark down staircase. The up staircase could be opened up with the removial of the concrete and replacing with metal railing. I think its two things: people traffic and the people that hang out over there. I agree take the escaltors out and put in a real stairway. I have been wondering about the escalator too. It became such a joke that I started taking pictures of it every time it broke down. Someday I’ll make a photo montage. if you’re serious about the plethora of thugs, aggressive panhandlers, drunken club goers being solved by throwing tax money at using a guard just so that an escalator has a better chance of functioning, i think that you should reexamine yourself. consider all of the other ares of seattle and other cities that have larger problems. then think about whether or not what you said makes any sense. if you think it does still make sense, then you should probably move to a city where there are no covered escalators to complain about. Forget security, get an elevator attendant. Reduce down to one elevator, get rid of the escalators, and get an old school elevator attendant. investing in a video security system for the escalators, with prominent signs and lights so that people who are vandalizing them get photographed, recorded, and the images either sent to the police (there’s a police station a few blocks away) or to property management? Just like banks, people tend not to break the law when they know they are being watched. I agree completely with NWBill: Extra lighting would help. I don’t mean a couple 40W bulbs; I mean floodlights. West side of the building could use extra lighting too. It’s broken at least 80% of the time. Perfect fit for the very worst of all QFC stores. The management quality is on such a low plane, it would be funny, if not for the fact they are close to my apartment. Anyone with a choice should never grace their door. Why can’t we all just have jet packs to fly around with??? Then we would need elevators, escalators or stairs. Working escalators are great for the elderly people who don’t feel safe in the elevators – which are very slow, and very sketchy. Escalators that work provide an alternative, especially while having to carry groceries. If not working, that’s a steep stairway. This is the last straw! I’m organizing an Neighborhood Watch posse to put an end to this problem. Get you carry permit, pack your pistol, and join me in taking back that escalator! If we can’t keep that escalator running 24/7, the hoodie-wearing, Skittles-eating criminals will have won! Agreed. It would do the customers good (even the elderly) to walk a few stairs. The escalators are not necessary. This would immediately stop the vandalism by the plethora of sketchy people who hangout there. I don’t even like to walk swiftly by that corner, let alone shop there. As has been written several times previously, there are stairs to the right of the doors. You can’t just “put up a concrete ramp” from the ground level to the second level to be ADA compliant. Gary, I’ll mention your post when I go into QFC next time. I seriously that’ll be the right way to go but you should contact the owners/property managers to the property if you think you can fix their problems and save them money.